The Quickstop Fire Sprinkler Shut Off Tool is designed to temporarily stop the flow of water from a fire sprinkler. We highly recommend having this tool on hand in facilities with emergency fire sprinklers. The Talon Fire Sprinkler Tool is a must-have for hotels, classrooms, and commercial buildings. It can take a long time to shut off the water, especially in larger facilities. Having this tool on hand can save a building from costly water damage. If you want your facility to have the tool it needs to shut off an emergency fire sprinkler, this is the tool you need. It’s reusable, adjustable, and easy to use. How does the Quickstop Talon Fire Sprinkler Shut Off Tool work? The upper arm slides around the threaded area of the fire sprinkler. The lower arm has a round rubber gasket that seals the opening of the sprinkler head. The gasket fits over the entire opening of the sprinkler which stops the flow of water. The Quickstop Talon is designed to stay out of the direct flow of water so it should be easy to attach to the sprinkler. Then you simply squeeze the clamp to put the tool in place. On the back of the tool, there is an adjustable screw and nut that can be raised or lowered, enabling the Fire Sprinkler Shut-Off tool to fit various fire sprinkler sizes. Every unit comes preset with the correct settings for the standard fire sprinkler size. There is also a red ‘quick release’ arm that enables the user to release the tool from a sprinkler system with one hand. Inside is a black rubber piece that when heated, expands and causes the tool to release the pressure, which allows the tool to function as a temporary sprinkler in the event of a second fire. 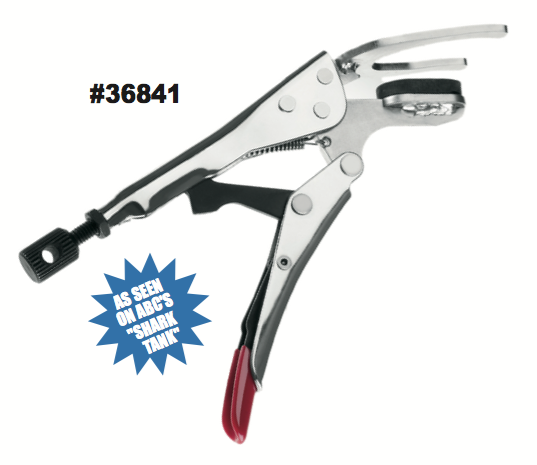 It is made of zinc and chrome plated steel, which protects the tool against rust. The Quickstop Talon has been tested to be 100% water tight up to 350 pounds per square inch (PSI). Plumbing Fact: According to the International Plumbing Code, a building with water pressure that exceeds 80 PSI requires a pressure reducing valve. This means that this fire sprinkler tool is functional well over the maximum water flow rate. What Types of Fire Sprinklers does it work on? This tool works on 1/2 inch and 3/4 inch fire sprinkler heads. Not only does this tool work for various sprinkler head sizes, but it also works on damaged and sheared units as well. The dimensions of the tool are 8 in × 3 in × 2 in. Order this emergency fire sprinkler shut-off tool by requesting a quote on our website, or by calling us toll-free at 800-442-6622 Monday-Friday, 7:30AM-5:00PM EST. Share the Quickstop Fire Sprinkler Shut Off Tool PDF with your facility director, maintenance team, or purchasing department to keep your facility prepared in case an activated fire sprinkler needs to be turned off.